Hey all you Portland-area readers: Been looking for a chance to show off your best home-cooked tomato sauce? Want to woo others with your fabulous strawberry cupcakes? Tempted to test out that recipe for dandelion jam? Now is your chance! 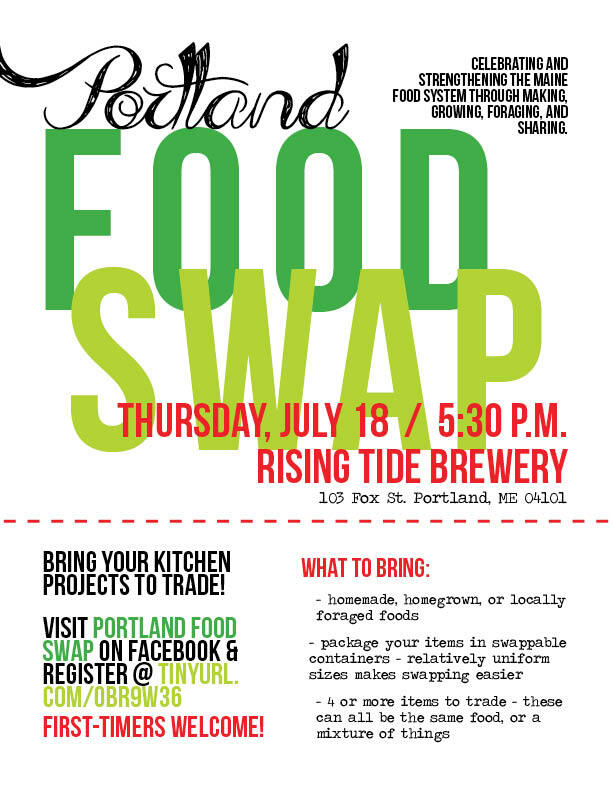 The next Portland Food Swap is on for this Thursday, July 18 at Rising Tide Brewery from 5:30 – 7:00 p.m. The swap is free, open to anyone, and first-time swappers are welcome. All you have to do is register for the swap, and hatch a plan for something swappable (homemade, homegrown, or locally foraged foods). You can find out more and get ideas on the Portland Food Swap Facebook page. Hope to see you there with your tastiest treats! One thing I find truly satisfying is traveling by a strawberry field in late June or early July, windows down if in the car, and drinking in the sweet aroma of ripe berries. For all our human attempts to recreate, bottle, and aromatherapy this essence, I don’t think it can be found in anything other than a fully sun-ripened strawberry. And you can forget those wooden, white-cored monstrosities that arrive at our supermarkets year-round. No, the fact that there is a short window of time to enjoy this pleasure, makes it all the better. 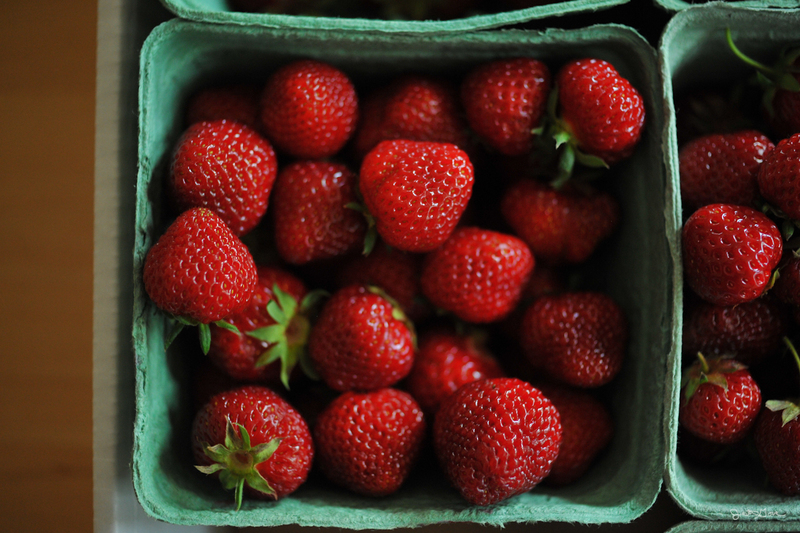 In Maine the arrival of the strawberry is even more gratifying, as it brings us one of the first true scents of summer, well before our tomatoes grow and ripen, even preceding our state’s prized blueberries. While there are unending applications for the fresh field strawberry, my favorite is perhaps the most simple: cut berries, a bit of sugar, and a healthy squeeze of lemon. The preparation was one I learned from Giuseppina Tomassini, a dear friend who welcomed me into her Italian kitchen when I was first becoming adventurous as a cook. I met Giuseppina’s strawberries before I met her. They were delivered in three delicate glass dishes by her son, Valerio, upon my parents and my arrival in Ascoli Piceno, one trip to Italy. We were staying in an an apartment that was attached to their house, where I would take up residence for about a month. The trip from Camden, Maine to Ascoli Piceno, Italy is not exactly grueling, but it is a 24-hour affair with several legs, the final of which involves a long ride from Rome on a double-decker bus made for short people, not those of my family’s stature. A day of travel inevitably involves a lot of sitting, probably a few too many carbs, lack of sleep, lack of shower. 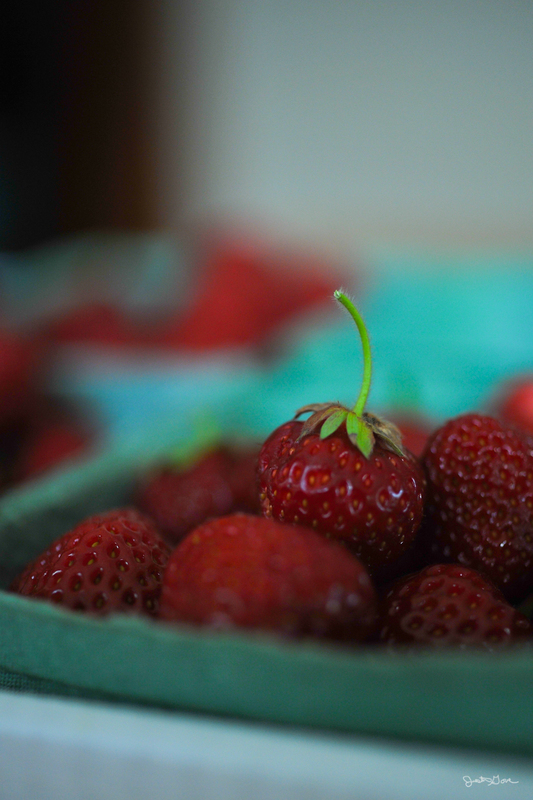 The strawberries, just in season when we arrived, were exactly what we needed without knowing we needed it. It is nearly impossible to describe their effect. I can say they invigorated and awoke us. They were tart, refreshing, nourishing. They tasted as perky as we hoped we would soon feel. Perhaps most importantly, they marked the first gesture of a unique and cherished friendship that would form between the Bedford and Tomassini families. 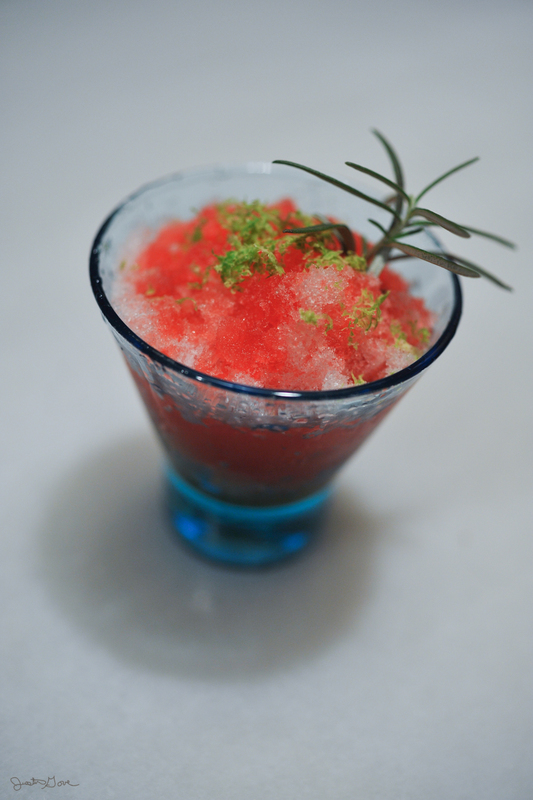 In classic Italian fashion, their goodness was based almost solely on the goodness of the berry. Just a few graceful touches to accentuate what was naturally there. As someone who has always politely picked around a serving of strawberry shortcake (too sickly sweet! ), I was overwhelmed by admiration for Giuseppina’s dish. I think she found some quaintness in our adoration, and also a bit of well-measured pride as she invited me to cut berries and whip up a new batch by her side. “Mescola, mescola,” she would instruct, much as she did when she taught me how to properly dress a green salad (majority olive oil, touch of homemade white wine vinegar, and sprinkle of salt). Mix, mix, it needed a good, healthy mix. With each turn the they grew a deeper red, and more fragrant, expressing everything I would imagine a strawberry should ought to. June in Maine means rhubarb. While I love this tangy vegetable, I don’t particularly care for the solution that so many pie recipes take, which is to team it up with a load of sugar, or mushy, cooked strawberries, in order to counter rhubarb’s natural sourness. 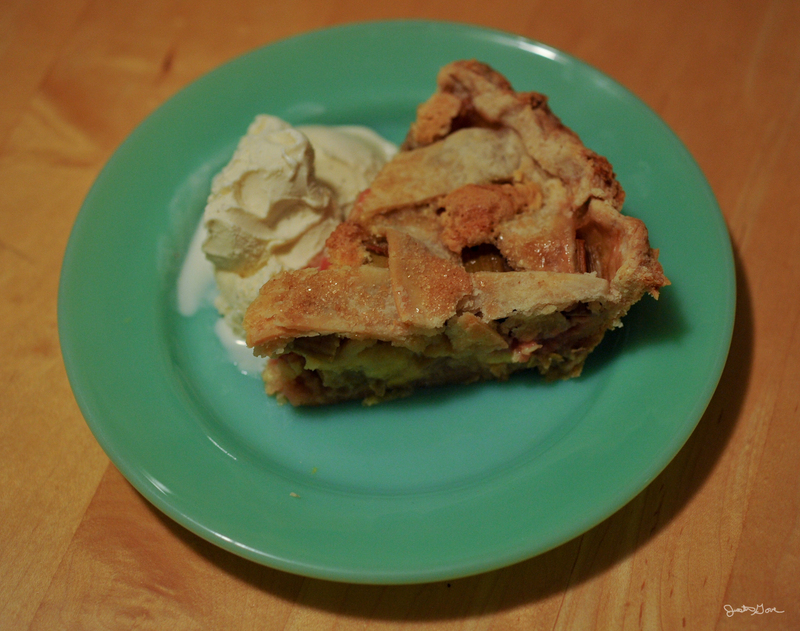 What’s more, I find the texture of all-rhubarb or strawberry-rhubarb pies to be a little too … well, gelatinous. Luckily, I’ve got rhubarb custard pie to turn to. One of my favorites, my dad and I always demanded that my mom make this pie at the beginning summer, and it’s a tradition I’ve carried over into my own kitchen since returning to Maine. Although you might debate my gripe against strawberry-rhubarb pie, it’s pretty hard to make a case against custard. Who isn’t looking for an excuse to eat custard? It provides a nice base for the rhubarb to sit up on, and keeps it from disintegrating into a gummy goo. This allows the rhubarb to retain its natural shape and flavor – so you get pure rhubarb tang in each bite. While I must admit the custard in this recipe is sugary, it is balanced by the warmth and sturdiness of egg and nutmeg. 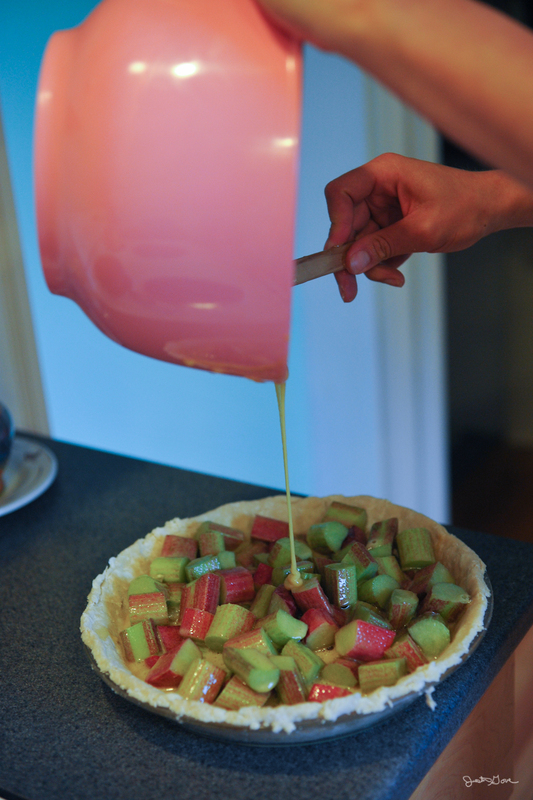 Yes, in my book custard is an ideal partner for rhubarb, further made perfect by a lattice-top double crust and a dollop of really good vanilla ice cream. To be honest, because I can’t say enough about this pie, I’m finding it hard to say anything about it. I recommend you make it. Your loved ones will thank you. Note that the recipe that follows does not include measurements for pie dough; just make your preferred recipe in a double-crust quantity. One thing that I’ve discovered over the years is that this pie does not benefit from a large pie plate; standard 9 or 10 inches is best for ensuring the custard is well-set without sacrificing your crust in extended cooking. Interestingly, this recipe has disappeared from newer versions of the Better Homes and Gardens Cookbook, which is where my mom originally found it. A bit of an antique, it is well worth dusting off. Prepare 5 cups of rhubarb, sliced into one-inch pieces. Set aside. Preheat your oven to 400 degrees, and make your pie dough. Lay the bottom crust in the pie plate, and roll out the top crust. MIx up your custard by whisking together 1 1/2 cups sugar (fine organic cane sugar is best), 1/4 cup flour, 1/2 teaspoon nutmeg, dash of salt, and 3 eggs. Once smooth, add the rhubarb to custard and mix together so the all the rhubarb is coated. Add the mix to your bottom crusted pie plate. Dot the filling with a tablespoon or two of butter (broken into pea-sized pieces). Cut the pre-rolled upper crust into one-inch wide strips to form your lattice. 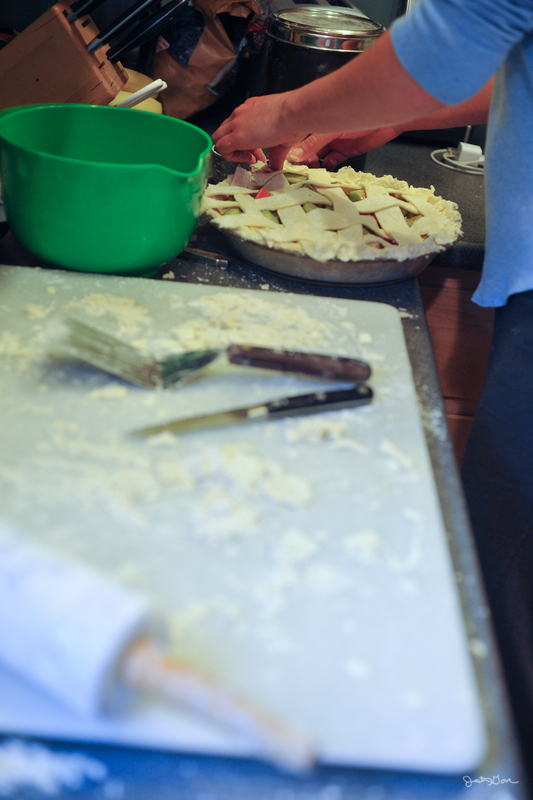 Weave your lattice over the top of the pie, crimping off the edges. Sprinkle with coarse-grain sugar and bake at 400 degrees for 50 minutes. 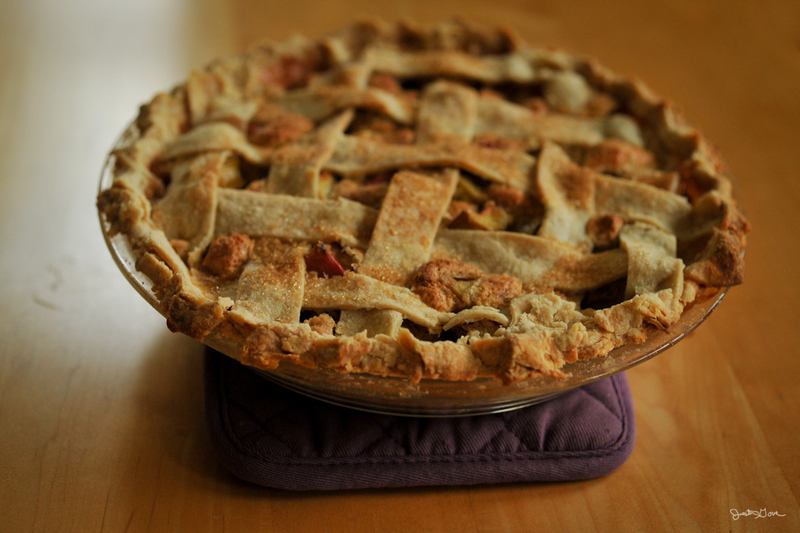 I use Mrs. Anderson’s Pie Crust Shield to protect the edges, and allow the pie to stand in the cooling oven when I turn it off after the 50 minutes. Using a standard 9 or 10 inch pie plate, your custard should set up fine! I must admit I had my doubts when I found myself alone in the kitchen with two pounds of butterfly-cut “capicola” pork shoulder. Those sweet-talkin’ butchers at Rosemont Market had sold me on it, and while anyone could see it was pinkly fresh and lovely, what the cuss was I going to do with it? I just couldn’t fathom that the technique they suggested, an 8-minute sear on each side followed by another 20 minutes in the oven, could really be the trick for this particular cut. Wasn’t this a low and slow, roasty kind of thing? Pork shoulder? I’m no expert when it comes to cuts of meat, and the Rosemont butchers have never once lead me astray, yet I always find it daunting to pull off a meal with something new. I mustered my courage. Well, I told myself, the only direction from here is forward. However, what was the direction forward? While the butcher in question, Evan, recommended serving the pork with a mango-based salsa, I had forgotten to get fruit. I couldn’t bear the thought of facing the overcrowded supermarket in order to obtain what would likely be a sour, disappointing specimen, so I started the pork simply with my old friend and secret weapon, Central BBQ Rib Rub. Until recently I traveled to Memphis about once a month for work, and it was a rare trip that I didn’t get to Central BBQ. It was the only barbecue joint I knew of that had negotiated partial desegregation with the genre of soul food. They offered collard greens on their menu, no small thing in a place where cole slaw, potato salad, and beans enjoy a gangster-like hold on the side dish menus of barbecue restaurants city-wide. They also sport an outdoor patio, friendly counter staff, local Ghost River brews, and lead in the city’s Project Green Fork movement to help restaurants integrate more sustainable practices. Of course Central also had the rub. Most times I would justify squeezing into my suitcase a bag of pork rinds and extra-large shaker of Rib Rub, which is to say that we have a kind of bomb-shelter’s supply of rub. I don’t know what is in the rub, and I don’t care. Knowing would abuse the rub of its magic, and one day when I run out of it I will simply place a call to a Memphis contact and negotiate that a large box of rub be mailed to my house. Naturally, the rub is where I started with the capicola pork shoulder in question. I gave it a good rubdown and went on a walk to see if I could figure out the rest. As is so often the case, I encountered sound logic while on my walk. 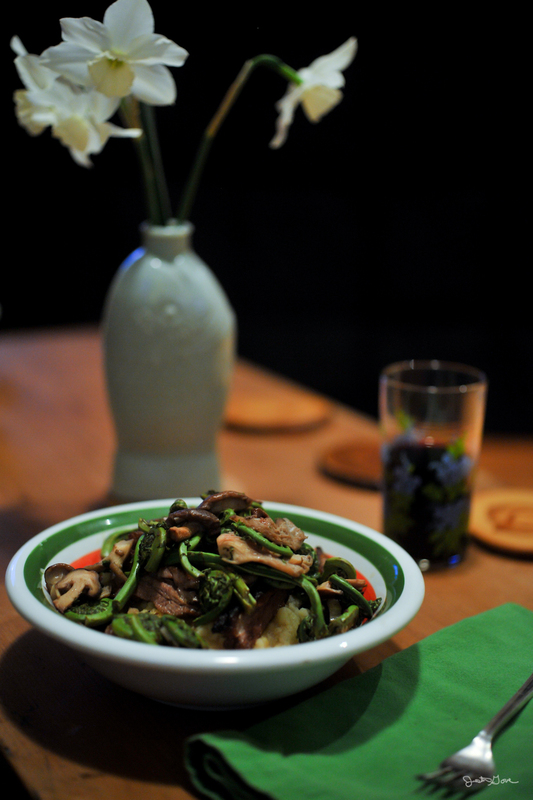 I would make a potato mash, top it with chopped pork, and top that with garlicky fiddleheads. Done. When I got home I remembered the mix of oyster and shitake mushrooms in the fridge, which would make a nice addition to the fiddlehead sauté. And the scraggly end of cheddar cheese would find good purpose in the mashers, as would a healthy dose of buttermilk. To say that things came together would be an understatement. This is by far one of my favorite could-have-been-a-disaster-but-it-turned-out-great inventions yet. Using Evan’s recommended technique, the pork developed a character not unlike a barbecue rib, with a crispy exterior bark and a tender, juicy interior that was well-blended with melty fat. The buttermilk and small amount of cheddar gave the buttery mashed potatoes a nice note of sour dairy that was countered by the earthy fiddlehead/mushroom sauté. Each was stronger for being partnered with the others, so the approach of layering them in a bowl was both easy and beneficial. Pleasing me even further, all of the ingredients were Maine-sourced except the mushrooms and, of course, the Memphis rub. While the recipe that follows is a bit lengthy, I can assure you that this was not an overly complicated meal to make. Better, two pounds of pork made enough for four portions, and when we duplicated the meal the next night, the leftover pork was even better reheated. Warmed in a vegetable-oil coated cast iron pan, covered and at medium-low heat, the reheated pork formed an even crispier crust without losing any of the original juiciness or flavor. The biggest imposition in recreating this meal would be getting a quality cut of meat (clearly no problem if you live near a Rosemont), and sourcing fiddleheads which are only foraged for a short period of time in May and June, typically in Maine, Quebec, or New Brunswick. But if you are reading this and fiddleheads either aren’t in your area, or aren’t in season, I’d imagine a worthy substitute could be realized in greens or – one of my favorites – fried okra! But I digress. The recipe follows below. Rub your butterfly-cut pork shoulder (the “capicola” cut I got from Rosemont basically denotes the hog’s nape-area, also known as “capocollo” in Italian) with your preferred spice blend at least two hours before you plan to start cooking. Believe it or not, I just found the recipe for Central BBQ’s rub on Food Network’s website (I averted my eyes lest the secret reveal itself to me. I plan on living in mystery and, Borys, I’ll still be calling in that favor in a few years). Preheat your oven to 350 degrees. Lightly coat a large cast-iron (or other oven-proof skillet) with vegetable oil and bring to temperature over medium-high heat. Add your pork to the pan, fattier side down, and cover. Cook for 8-10 minutes, reducing heat to medium if necessary. 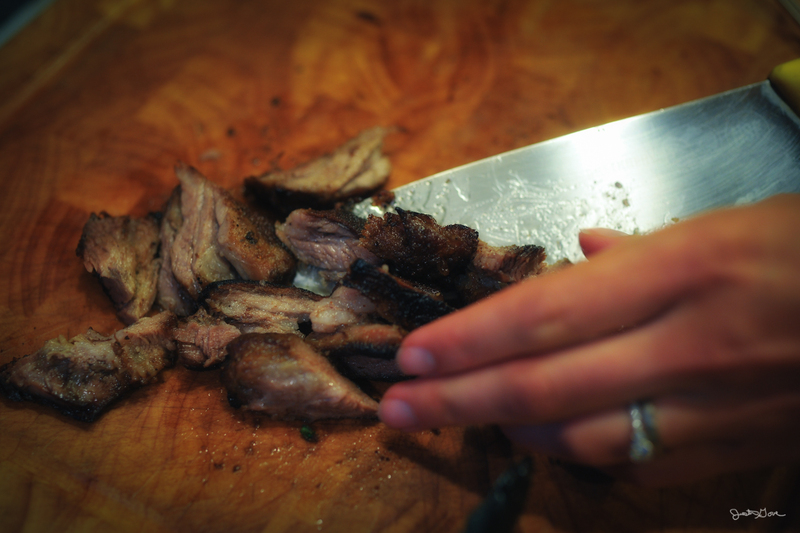 The meat should get a rich, dark sear to it, but you don’t want to burn or blacken it. As your pork sears, wash and cube potatoes (I usually do one to one and a half medium-sized potatoes per person). Place in a saucepan and fill with cold water and plenty of salt; bring to a boil. Flip and cook pork for another 8 minutes before transferring to the oven (still covered). Chop one clove of garlic and thickly slice shitake and/or oyster mushrooms; set aside. Strain fiddleheads, and add 1 tablespoon butter to the pan, returning to heat. Once melted, add garlic, mushrooms, and salt; sauté for about 3 minutes before adding in the fiddleheads. Stir, turn off heat, and cover to keep warm. As soon as the fiddleheads are added back to their pan, drain the potatoes and prepare the mashed potatoes to your liking. I apologize, I never measure anything! For my three medium-sized potatoes I added maybe 3 tablespoons of butter, 1/2 cup buttermilk, 1/4 cup milk, salt and pepper to taste. I mash this up with an old-fashioned potato masher, then mixed in about 1/2 cup shredded cheddar. Note that over-mashing will make your potatoes gummy. Finally I retrieved my pork from the oven and chopped it up. I assembled the whole shebang in a shallow bowl, tots on the bottom, chopped pork in the middle, and fiddlehead mix on top. There you have it. A delicious spring dinner in a bowl. I must have been about 16 when it occurred to my father that the proliferate Maine dandelion could be combated by your average household Hoover. In other words, my dad vacuumed our lawn. I can admit (now) that I am a bit jealous I didn’t come up with the idea myself, though at the time I didn’t exactly enlist my services to get out the extension cords. Ours was a well-trafficked street. My dad, needless to say, is an original thinker. He was also onto fiddleheads well before the rising tide of foodie-ism. Of course Mainers have long known about these delicious furled fronds, but my dad is a Florida man who spent his formative years catching snakes and anoles in his parents’ turfy Bermuda-grass lawn. Yet I have distinct memories of Dad disappearing somewhere into the reaches of our backyard every spring, and returning with a handful of those bright, wild spirals. He would then lay them delicately on a pillow of dampened paper towel inside a Tupperware container, and they would go into the refrigerator until we figured out something to do with them. Jim Jarmucsh has been famously quoted: “Nothing is original. Steal from anywhere that resonates with inspiration or fuels your imagination … Authenticity is invaluable; originality is non-existent.” This is indeed the case with cooking. While some might point to such culinary inventions as the micro-foam and jelly version of pasta Bolognese as original thinking by a Michelin-starred chef, in my own approximation such a dish can only be called tiny and strange. My brand of cooking is more about necessary interpretation, a “let’s see what we can do with this here” sort of approach to cuisine that usually starts with an ingredient or two from which a meal can be built. Most of my tricks have been stolen from a potpourri of other cooks so I suppose you could say that my cooking – and this could be true for all of us – has no choice but to strive towards the authentic. 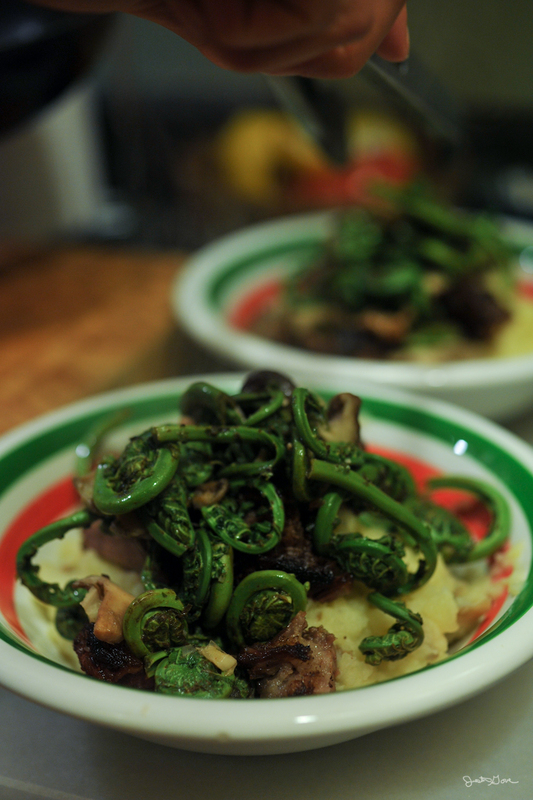 But back to fiddleheads, I would have to vote for them as one of my favorite and most inspiring ingredients. Because they are neither cultivated nor farmed, and are available only in New England for a short time between May and June, there aren’t a lot of recipes to get distracted by. 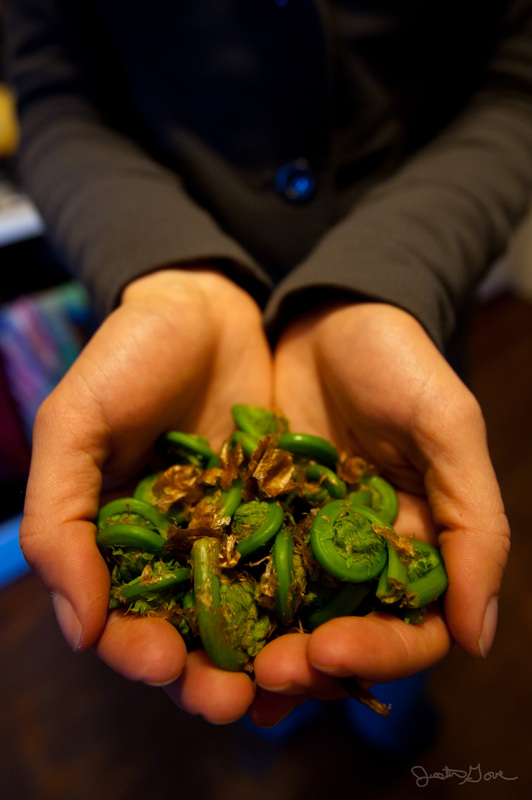 And having made the unfortunate discovery that fiddleheads do not freeze well (they turn into their exact opposites by becoming brown and spongy) I make it a point to prepare as many pounds as two people can consume during their short season. This means coming up with some creative, some might say authentic, variations to keep things interesting. My approach always begins with the basic technique I learned (stole) from my dad: parboil, drain, then sauté with garlic, butter, salt and pepper until the bitterness is gone. Since these days most people shun an overcooked vegetable, the tendency is often to remove fiddleheads from heat before they are truly done. 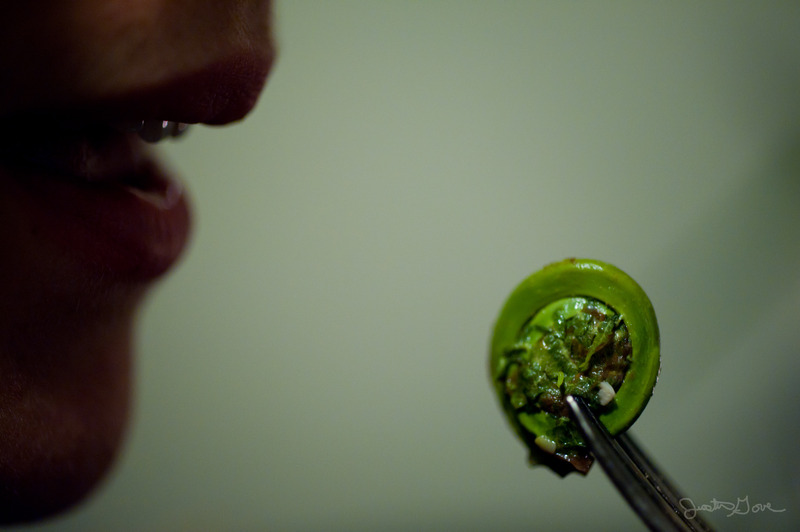 Although a lightly cooked fiddlehead will be pleasantly crisp, it will also retain a metallic bitterness that has the mouthfeel of sucking on an old penny. Interestingly, I have found that fresher fiddleheads often need to cook longer (usually on the order of 7-10 minutes). A properly cooked fiddlehead brings out a silky texture in the plant, softens the bitterness, and also ensures that naturally occurring toxins have been removed. Of course it is easy to stop here, toss the cooked greens alongside a cut of meat, starch, and call it a day. Which is just what I did with my first batch this season. Justin and I had visited our parents and returned on a Sunday evening to our urban abode – he with venison steaks from his father, and I with fiddleheads from mine. I had also picked up some fresh butter at the Washington farmer’s market, from Snowy Hill Farm, which lent the greens a pungent and grassy flavor. Along with mashed macomber turnips we savored and remembered our midcoast weekend, washing it down with an earthy Sangiovese. 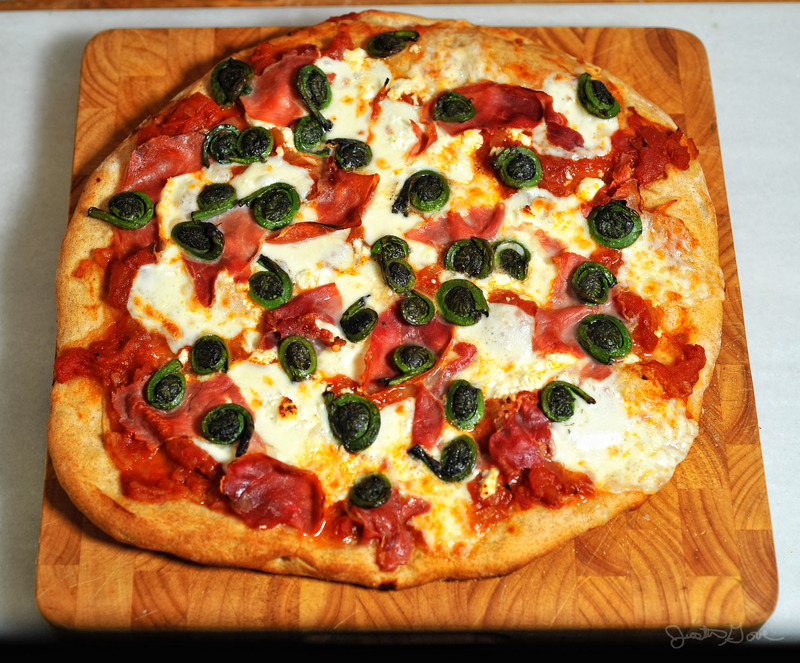 The following night we enjoyed our fiddleheads atop a homemade pizza with prosciutto and fresh mozzarella, and the next in a bright yellow omelette made with farm eggs and Snowy Hill’s “Dill Bovre,” a kind of cow’s milk chevre spread. And by Wednesday, having made a smallish dent in my booty of juvenile ferns, I was anxious to enact a recipe that I had been mentally plotting for days. Surely someone, somewhere, has come up with it before, however, I am none-the-less proud of my culinary revelation that cooked fiddleheads can be simply, deliciously, chopped into a pesto. I just cook the fiddleheads as my dad taught me, let them cool, and lightly blend in a food processor with a bit of olive oil and extra salt. 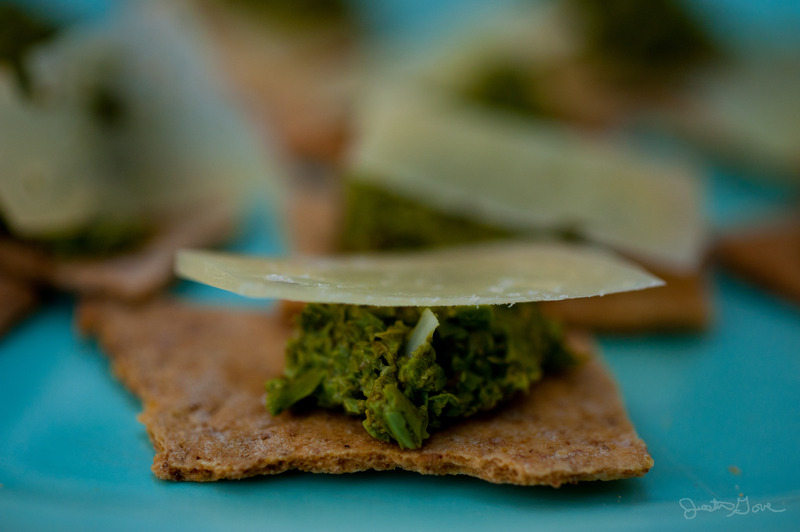 In the past I used the pesto as a topping on crackers (it is particularly good with an Italian truffle pecorino cheese) but it had never occurred to me that it might also serve as a kind of pasta sauce – just like a traditional pesto Genovese. Okay, so it’s not exactly as original as vacuuming dandelions from the front yard. But it was delicious! I simply prepared my pesto (along with an extra batch of fiddleheads that I kept whole) and tossed with a fresh mushroom linguine from my favorite pasta man, Al Capone (located in Somerville, MA). On top I crumbled a generous portion of Snowy Hill ricotta salata, sautéed shallots, and crispy prosciutto that I had lightly toasted beforehand. 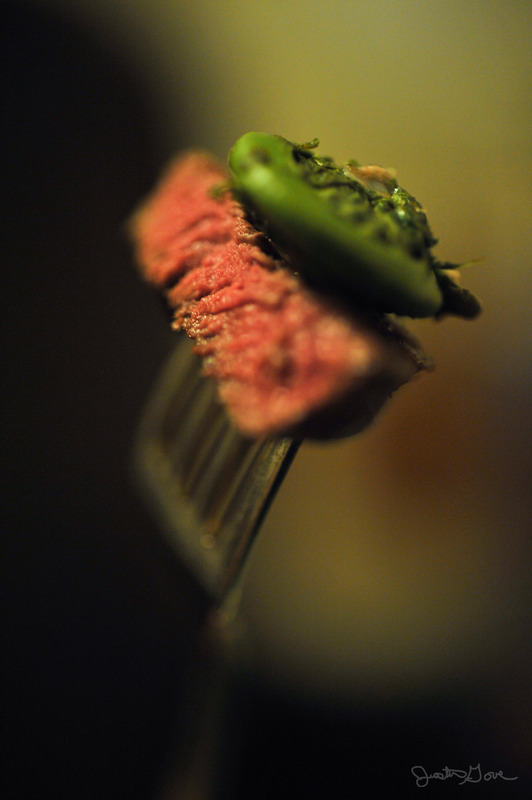 Needless to say this dish was the highlight of my fiddlehead season. It brought the kind of joy that, for me, is best discovered in the kitchen through the process of creating something that feels, well, sort of authentic. And those lovely ferns help me do just that. Sometimes I wait too long to make my lunch, and I turn into an evil Jekyll of myself, tearing through kitchen cabinets, greedily slicing off hunks of cheese, and messily assembling weird meals in a kind of delusional haste. Yesterday I had one such hunger squall, but managed to temper my monstrous cook in the kitchen by amusing myself with the construction of a little yellow and green sandwich. Like many of these ill-planned lunches, I began with an idea that would be impossible, or ridiculous at least, to see through. Egg salad! I thought. 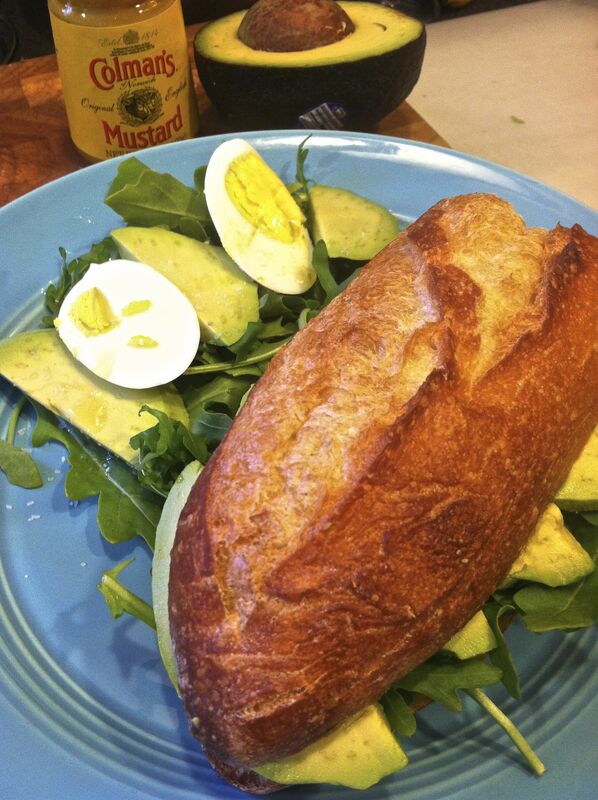 I have too many eggs, a relatively fresh baguette, and some arugula. Sounds great. Oh, but no mayonnaise. Maybe I’ll make mayonnaise! Right. As I boiled the eggs I looked up mayonnaise recipes and quickly realized that I was in no position to attempt it. But there was an attractive looking avocado batting its eyelashes at me from the counter. I thought it might be just mushy enough to take the place of the mayonnaise, and pondered for a moment mixing up an avocado-egg salad. A hideous brown slurry appeared in my imagination, like acrylic paint projects gone wrong in so many middle school art rooms. Best to keep the lovely items separate. 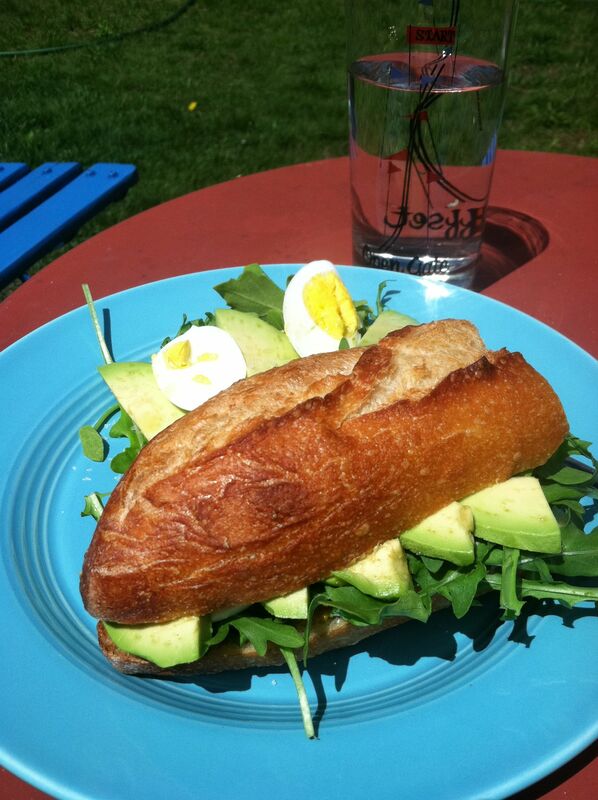 Step One: Slice baguette, slice avocado, build layer one on top half baguette. 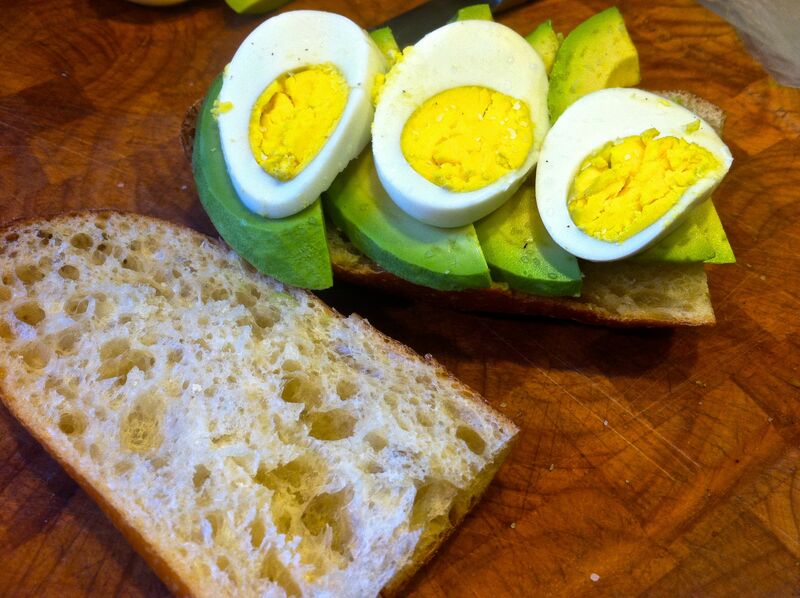 Step Two: Slice hardboiled egg, build layer two on top of avocado. 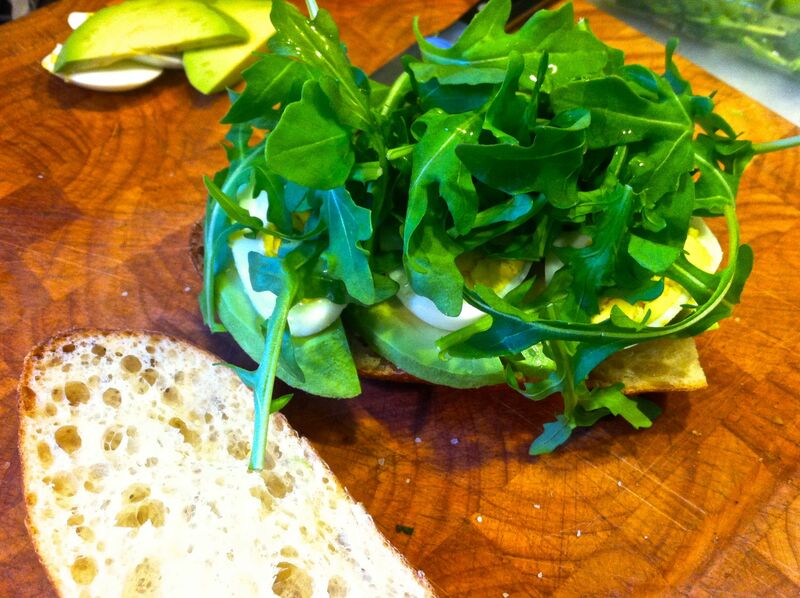 Step Three: Top with arugula, drizzle lightly with olive oil and salt. Step Four: Spread thin layer of peppy mustard (Coleman’s preferred for its extreme yellowness and bite) on bottom side of baguette. 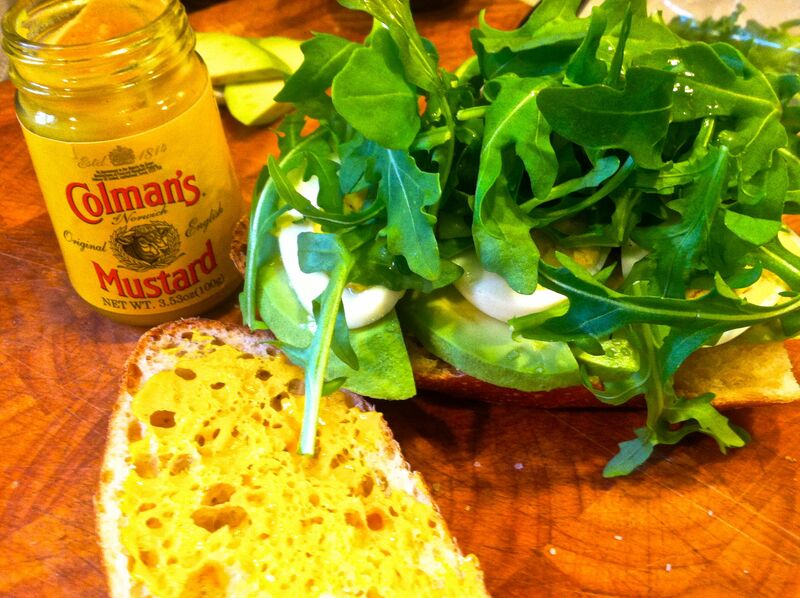 Step Five: Smash together, assemble remaining ingredients into a tiny salad with olive oil and salt, and get chewing!